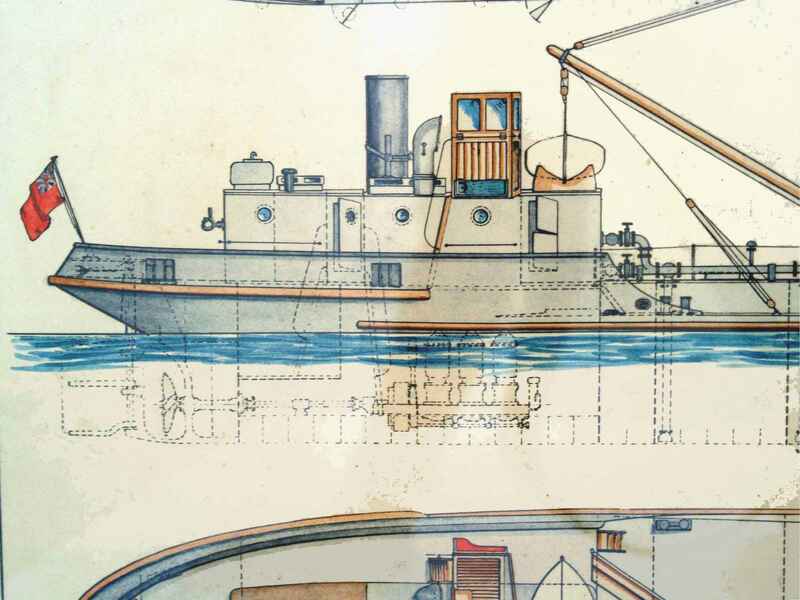 Unframed 20 1/4" L x 14 1/4" H Framed 231/4" x 17 1/4" x 1 1/4"
PRESENTED is an original shipyard drawing by an unknown draftsman, artist of a small stack steam ship. The drawing is a rare piece of shipyard advertising art and was used to show prospective owners what the yard was capable of doing. 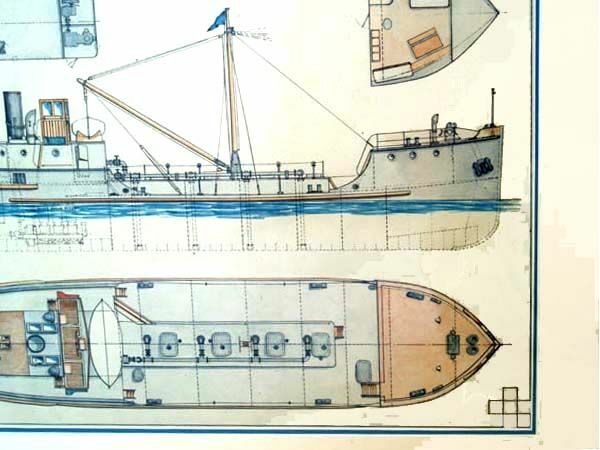 In this case, based on the piping and valves shown on the deck view of the drawing, this vessel was a rigged for carrying liquid cargo, maybe fuel oil. After the plan type drawing was complete water colors were washed over certain areas to high light them. The colors range from orange to a dark blue with brown highlights. Paintings such as this are very rare, and this is only the second one we have ever seen. The framed 231/4" x 17 1/4" heavy paper, has been recently custom framed for your enjoyment. NOTE: The photographs were taken through glass, and what may look like stains, or discoloration are really shadows. There also are some minor distortions affecting what should be horizontal lines. Not much is known about this genre other than steam ship lines distributed posters and paintings which were displayed in travel agent offices to attract their customers. Ship builders made various types of ship models which were used as examples of their works and which were presented to owners for similar use. This example of a drawing being used as a sales tool is very unique, and a rarity. 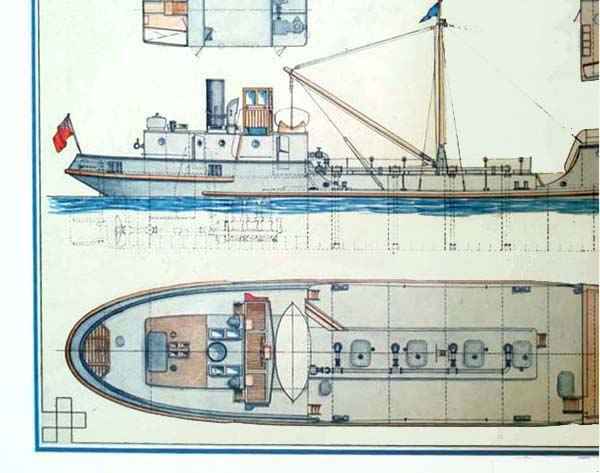 A painted ship's design plan is a rare find. It is suitable addition for any collector of marine antiques. Buy now! OUR UNCONDITIONAL “NO NONSENSE“ GUARANTEE: If not completely satisfied with your purchase it may be returned, if without damage, within five days of receipt in its original packaging. Return items must be insured for their full value. Only a prior email authorization by us for the return is required. Shipping charges are refundable if due to our error within the continental United States.